NEWPORT BEACH, Calif. -- Golfers who drive by the Hyatt Regency Newport Beach are sure to be intrigued by the Back Bay Golf Course sign on the hotel's entranceway pillar. 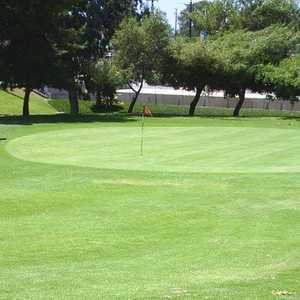 Back Bay Golf Course is the rare pitch & putt with forced carries over vegetation. It makes it seem like there's a full golf course right behind the hotel and, knowing this neighborhood, a high-end one with ocean views. Even after doing some Internet investigating and finding out Back Bay is actually a par-3 course, many golfers remain interested. 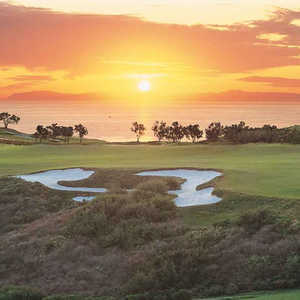 Especially if they read the literature touting it as the best par-3 course in Newport Beach. This is the land where you can run into Sean Penn at the grocery store (Whole Foods of course), a town where Britney Spears sometimes shops and parties (and not necessarily in that order). Almost everything in Newport Beach is ritzy and ritzier. Heck, even the center-of-it-all Fashion Island mall forgoes the usual tired carousel in favor of a choo choo train that little kids love to ride. Surely, the grand par-3 track will be equally impressive. In a word ... No. For one thing, Back Bay isn't a par 3. Not even close. It's a pitch & putt. The longest hole here measures in at 100 yards. And that's one hole. Six of the nine come in at 70 yards or less. The whole nine is 645 yards total -- or one John Daly par 5. You will not find par 3s like this on any course in America that wasn't designed by Pee Wee Herman. And yet the Hyatt's literature touts Back Bay as "a challenge for those who want to improve their short game." Yeah, that 55-yard third hole is really going to provide great prep for one of Tom Fazio's 240-yard par 3s squeezed by bunkers as large as one of Back Bay's complete holes. "It's not quite what I expected," visiting businessman Gary Matteson said as he walked back toward his room. Matteson lugged an entire set of clubs around Back Bay, including his new $350 Nike Sumo driver. He wasn't in the mood to discuss the club's merits after putting out on that daunting 100-yard ninth hole. That's the problem with Back Bay. It deceives golfers -- and we're not talking about the slope of any greens. One of my little golf pet peeves is pitch & putts that try to pass themselves off as legit par-3 courses. It's not an epidemic facing the game or anything like that, it's just annoying. And if you weren't ticked off at Back Bay, you could truly enjoy this little pitch & putt. How many pitch & putts do you know with views over sparkling blue water? 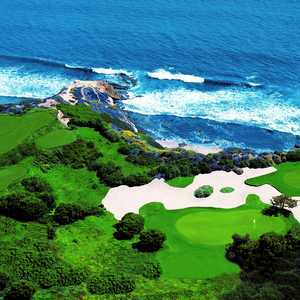 Back Bay provides that, looks at the multi-million dollar yachts in the harbor and green conditions that many full courses would love to have. If you can't hit your wedges great with these fairway lies, you may want to consider the shuffleboard courts at the Hyatt Newport instead. Back Bay is a perfect place to take your kids when they get upset that you've been spending so much time on vacation golfing without them. Ten-year-olds can have a blast here and something of a golf education. This isn't just flat, straight-on boring golf. There are shots up to greens on hills, shots down to greens on plateaus. There are even a few forced carries over flowers and vegetation. While the kids are having fun, you're going to be smiling too. This is a pitch & putt where a water breeze ruffles your shirt. This is a pitch & putt where mammoth mansions loom on the hills in the near distance. This just might be the place where your kids fall in love with the crazy game of golf. That's pretty cool. If only Back Bay let everyone know that coming in. It's time for this little pitch & putt to stop pretending it's something else and take pride in what it is. If you come to Back Bay expecting a legit grownup golf experience, you'll leave disappointed -- and maybe fuming over hauling your bag around the course. If you come to Back Bay with your kids, grandkids or nieces and nephews, you'll almost assuredly be back. Though you still may find some minor annoyances. Like the college kid in the cramped starter's shack/pay station informing you that the credit card machine in front of him is so old that it's unusable. Sorry, he'll tell golfers, cash or room charge only. Why's the credit card thing there mocking golfers then, exactly? And what the heck is the Hyatt waiting for to replace it? Cash only is fine for your local mom & pop pitch & putt. But this is a want-to-be world-class hotel. Telling golfers they can use the ATM in the lobby -- one of those hotel ones that gets Hyatt plenty of surcharges -- just doesn't cut it. That said, at least Back Bay's fees are pitch & putt-like. It's $12 to play the nine during the week, $18 on weekends and holidays. In Newport that's a family bargain, as long as you know what to expect. If you're playing Back Bay, you're at the Hyatt Regency Newport. This hotel is popular for business meetings and it boasts some better-than-decent-sized rooms. There are a number of pools and even some ping-pong tables. Those looking for a true live-the-Newport-Beach-life splurge, however, want to stay at the five-star Island Hotel. It brings a whole other level of service. One of the best new spots in town can be found at the Pelican Grill, a restaurant inside the recently reopened Pelican Hill Golf Club that's anything but your stereotypical golf course dining. No hot dogs for dinner and plenty of sophisticated dishes like braised short ribs. It's already become a real Newport Beach scene too.